The Dodgers were in San Diego to play the Padres and what did the Los Angeles manager say? 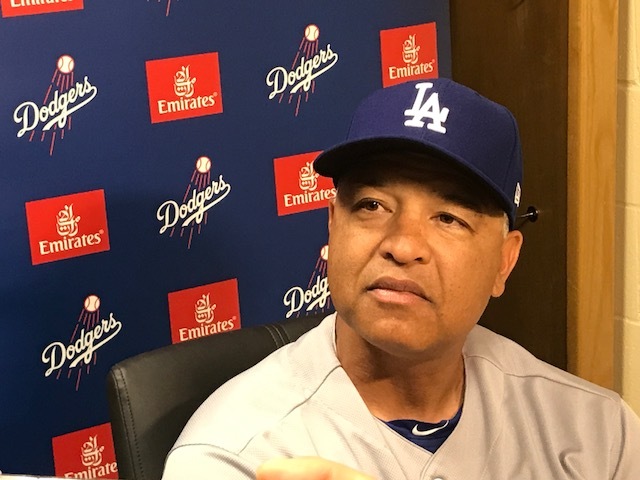 “This is a home game,” Dave Roberts said. He was joking, a tad, although the sea of rowdy Dodgers boosters was difficult to ignore. Plus, one can take Roberts out of the North County, but you can’t take the North County out of Roberts. His is a local resume which stretches to being a Little League tyke in Vista, a three-sport star at Rancho Buena Vista High and then playing and coaching for the Padres. Cardiff remains his home as his son, Cole, is Santa Fe Christian’s starting shortstop, and his daughter, Emme, is primed for a lead role in “Willie Wonka” next month at the Christian Youth Theater in Carlsbad. Roberts works in that big ol’ city about 100 miles up Interstate 5. But he couldn’t hide his smile upon his return. Roberts, 45, is always sunny, even if his team is struggling. The Dodgers are the defending National League champions but the deafening noise comes from the constant reminders of what they didn’t do: win the World Series after falling to the Houston Astros in game 7. Instead of Dodgers fans celebrating the squad’s first league title since 1988, they groan and moan about the final contest that went the other way. The Dodgers also seem to be a funk, residing in the National League West cellar when they arrived at the southern end of the Golden State. Being under the microscope isn’t new to the Dodgers. The challenge is rebounding from a heartbreaking loss that prevented a downtown parade and the 2017 bunch being mentioned among the iconic franchise’s all-time teams. Instead, Dodgers boosters have to remain content with the joy of six world championships. Truth is, a month doesn’t make a season. And while the Dodgers search for another gear, they’re happy Roberts’ mitts are on the wheel. Roberts didn’t receive the same affection from the Padres after they dismissed Solana Beach’s Bud Black midway through the 2015 season. Despite being Black’s bench coach, Roberts wasn’t named the interim manager. When the permanent gig became available, Roberts couldn’t get an interview with the team he grew up cheering. When the Dodgers’ Kyle Farmer was younger, he looked at Roberts with admiration. Roberts’ ninth-inning swipe of second base in the 2004 playoffs prevented the Boston Red Sox from being eliminated and it led to their first world title since 1918. It was an epic theft of second base. But what Roberts really embraces is stealing time to be at home — in Cardiff. When settling in to watch the Masters, forgive Haley Moore if she offers four words: been there, done that. John, an Encinitas resident with a famous moniker, has an insatiable drive to save the world. The Padres shocked baseball by landing Manny Machado this week.